Mary and Helen just got back from a trip down south during which they visited the Biltmore estate. 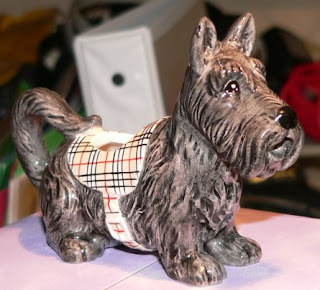 While there they picked up this cunningly adorable Scottie milk pitcher. We love it! Thanks again, M&H! I mentioned before that we started up the Thursday night stitching club again -- well somehow I let my sister talk me into learning how to knit. Ok, to be fair, I asked her because there are such cool things you can knit and crochet seems limited, but maybe that's because I'm not really advanced. Anyway she started me out with a simple project on circular needles. Hah! I think this is her way of getting revenge for nasty things I did to her when we were kids. It's horrible. My fingers are clumsy and it turns out I was knitting backwards, or inside out or something, which made it worse. Even after Annie corrected me it's still the pits. IHE. Keep going! Its not unlike your introduction to baking. I remember your first seven layer cake - it was about 3 inches high. Of course, I don't remember having anything you've baked recently.